Meow! by Katy Perry is a companion piece to the singer's first fragrance, Purr, and was created while Perry was on the California Dreams world tour promoting her platinum-selling second record, 'Teenage Dream.' This rich follow-up scent is a wearable interpretation of the fun, sensual spirit of the tour—so fun, in fact, Perry felt the name of the fragrance needed an exclamation point at the end of it. Still, Meow! commands a soft sexuality appropriate for use during any time of day. Its signature comes from a pairing of honeysuckle and pear with the backdrop of creamy vanilla, musk and amber. 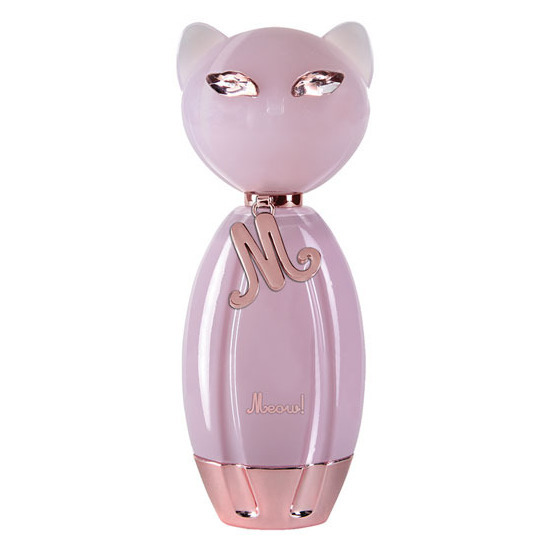 So while Purr marks Katy Perry's first foray into the fragrance world, Meow!, more than anything, embodies her energy. I love Meow! It's so soft and sweet smelling. The fragrance lasts on me all day, but it's not crazy overpowering. It's just the perfect hint of something sweet and interesting. Warm, comfortable, and inviting. Plus the bottle is just insanely adorable. Especially for a crazy cat lady like me! The sweetest, cutest, girliest perfume ever! I adore this perfume. The scent lasts for hours and hours and I always get compliments when wearing it. It really is one for girly girls, it's sugary sweet scent has hints of raspberries and vanilla and reminds me of freshly baked cupcakes :) I highly recommend this, plus it comes in a gorgeous pink cat-shaped bottle. What more could a girl ask for? This is such a light, feminine perfume! I love the smell of it.. I always receive compliments on how I smell good and the packaging is super cute too! Everything the girls have been saying on here about the scent is spot on. It's sweet and feminine, pretty at the same time, but also fun. I was searching around for post-holiday deals at my local TJMaxx and I found this perfume in a SOLID PERFUME LOCKET and I'm in love. So cute. If you find it, don't hesitate! SO unique and fabulous! Love this! Smells so good... I like that it has raspberry! Love that it captures a bit of katy in the scent. Fun light and sweet. Can be hard to find around me tho. Fragrant, nostalgic and playful - really liked this scent! My sister was given this scent for her birthday, but since she is not a "perfume" kind of girl, she gave it to me. I love the scent - it reminds of me of American Eagle about 8 or so years ago when they used to blast a delightful fragrance through their air vents. It is creamy, sweet and girly. I only needed to use a small amount and the scent lasted all day! I will definitely be re-purchasing this when the bottle is gone.